"Lois Lane is falling, accelerating at an initial rate of thirty-two feet per second per second. Superman swoops down to save her by reaching out two arms of steel. Miss Lane, who is now traveling at approximately one hundred twenty miles an hour, hits them, and is immediately sliced into three equal pieces." It's not the fall that kills you... it's the sudden stop at the end. One must specifically hit the ground to get killed in a fall. Grabbed a ledge? Hooked an outcropping with your Grappling Hook Pistol? Got caught out of midair? (By a giant robot?) Hit water instead of ground? Landed on an enemy? Fall in a dumpster? Congratulations, you're completely uninjured, no matter how far you fell beforehand. Some characters can fall dozens of stories or even out of aircraft, and survive more or less unrumpled as long as they fall through trees before encountering the ground. Under Newtonian physics, this is nonsense: you still decelerate from terminal velocity to a dead stop in less than a second, and it is the speed of the stop that kills. Then again, if you have a Variable Terminal Velocity, then the laws of Newtonian physics might not apply in either case. Amusingly, even works that take the stress of deceleration into account often simply ignore the stress of acceleration. Getting thrown halfway across a city square is pretty much equivalent to getting hit by a train. Even if the hero catches you carefully at the other end, you still end up ripped apart like tissue paper by steel-hard fingers pushing at you like jackhammers. This can happen in video games via Gameplay and Story Segregation. All bets are off if you have Nigh Invulnerability. Subtropes of this include Soft Water and Giant Robot Hands Save Lives, among all the other tropes potholed in that second paragraph. See also I Fell for Hours for incredibly long falls. See also Inertial Dampening, which can justify it in worlds where it exists. Kinda subverted in Kaleido Star: while in the trapeze, Leon drops May off, lets her fall a bit and then catches her by the hand, but the pull dislocates her shoulder. Later he does the same thing to Sora, but this time she's not injured because she was expecting it, and used her own strength to help Leon lift her. Mokuba tries to rappel his way down a tower using rope tied together from old bedsheets in Yu-Gi-Oh!. The rope isn't nearly long enough and comes loose, and he falls a long distance down... into some bushes, which saves him. The Abridged Series version comments "It's a good thing I'm a cartoon!" An early episode of Macross averts this. Our hero saves the female lead from a high altitude fall not by catching her in the opened cockpit of his fighter, but by matching her descent before sort of scooping her up. Still pretty crazy, but it had been established that he was a skilled stunt pilot before going military. This pops up all the time in Immortal Rain: when the only way out of trouble is a long way down, Rain scoops up Machika, tucks her under his arm, and jumps. In one scene they escape bounty hunters by jumping out of an upper storey of a skyscraper to the city street below; in another, a train bridge has been destroyed and they jump from the falling train to the canyon floor. The implication is that since Rain is perfectly capable of surviving that fall, anyone cradled in his arms would be safe as well. The characters of Mahou Sensei Negima use a Time Machine to Set Right What Once Went Wrong, not fully knowing how to set the spatial coordinates and thus appearing ten days earlier at several hundred feet in the air. Before hitting the ground, lead wizard Negi used his Wind Magic to both push the group off the ground and create a cushion of air as well, leaving every character without a scratch. This might have made sense if it were done in a slow descent if not for the fact that it was done at the last second only a dozen metres above ground. On a related note, the two heavy-hitters in the group, Kaede and Setsuna were able to survive the fall on their own abilities (they basically landed on their feet). Problematically in Setsuna's case, she decided to take actions to save Konoka herself, Bridal Carrying her on the way down. Note that Setsuna does this routinely to Konoka while jumping massive distances without incident anyway (she probably has some Ki-related method). Similarly, when School Newspaper Newshound Kazumi Asakura tried to expose the same wizard's magic, that atop his already-built stress at the other events surrounding him at the time caused his Wind abilities to explode through his voice. This sent Asakura into the air, to which Negi flew upward on his staff to catch her by the arm. Maybe justified in that he caught her before she actually started falling, but the strength of lift-off was enough to crack and break her cellphone. A Wizard Did It. Literally. In the Pokémon episode Nerves of Steelix, Jasmine leaps off the edge of a cliff and lands on her Steelix's head approximately fifty feet below with absolutely no injuries. At the climax of Pokémon 4Ever, Ash, Pikachu and the Iron Masked Marauder start to fall to their supposed deaths from thousands of feet in the air. Ash and Pikachu are saved by Celebi, but as for the Marauder…he wasn't so lucky. The Marauder continues to fall to Earth, and just when you were hoping for a Disney Villain Death, he lands in a tree and continues his fall, breaking a branch along the way. He then falls to the ground and starts to roll down a hill and off a miniature cliff, and somehow survives this. "Looks like Team Rocket's Blasting Off Again!!!" Dawn's Buneary has been known to use her twelve-pound body to catch things several hundred times her weight like it doesn't matter how fast they're going. It even happens in the manga from time to time. A particularly egregious case is Sapphire's dismount from her Tropius to catch a falling tree limb - and she survives not just the velocity of the fall (she was dropping from a higher altitude), but also the weight of the limb and the person and pokmeon which she catches on landing! Badass Normal, no kidding! Played straight during Naruto's training for the Chuunin Exams. Thrown into a deep chasm, after falling for several minutes he managed to summon a toad large enough to stop his descent... and bouncing off of his hard back didn't hurt at all, apparently. In Axis Powers Hetalia, Russia jumps out of a freaking plane WITHOUT A PARACHUTE because there is snow. Snow will save him. Granted, he does break his arm (in the manga he breaks all of his bones). The speedster version is explicitly mentioned in Cyborg 009. The 00 cyborgs can survive being transported by 009's acceleration mode because they are cyborgs, who have been enhanced to be more durable than regular humans. Any normal human who comes into contact with 009 while he's in acceleration mode would be killed instantly. In Ranma ½, it's not unheard of for characters to walk away from hundred-meter drops (in one such instance, they even left perfect character-shaped holes upon impact after falling off a mountain bridge and all the way to the ground.) On one occasion, though, Ranma fell off a Giant Flyer's back several hundred meters in the air, and was knocked out cold upon landing on a convenient log floating downstream. On another, Ranma, while carrying four girls on his back, blasted himself (and the girls) out of a Garden of Evil up to a height of at least thirty meters, and landed perfectly on his feet... then collapsed in a heap, both legs broken. In one episode of the anime, Akane gets knocked off the side of a cliff. Ranma runs down the side, gets to the bottom before she does, then catches her in his arms. She's perfectly fine afterwards. This is Ranma ½ after all. In episode 22 of Fairy Tail, Lucy jumps out of a jail cell that is at least a skyscraper in height off the ground and Natsu catches her. Amusingly, Lucy (who is a normal human besides her Summon Magic) is unharmed, while Natsu (who has Super Strength and is Made of Iron) is briefly knocked silly. Used scientifically in Gamble Fish, Tomu was able to survive the fall by making sure he hit the branches to slow down and the fact that there was a large amount of fresh snow at the bottom to land on. However he did ad the fact this only gave him a 1/10 chances of actually surviving the fall compared to the slim chance if he didn't. He is a gambler after all. In Fullmetal Alchemist, Ed slips off a snowy ledge and plummets fifty feet, landing through the roof of a wooden shed full of soggy dynamite. His only reaction is "Rrrgh… falling like that's gonna stunt my growth even more!!" Subsequently averted hard, when he gets blasted down a very deep mine shaft and gets impaled on a support beam, coming extremely close to dying. Kagura in Okusama wa Mahou Shoujo manages to catch Ureshiko when she falls from the sky. He hurts his leg a little when he lands (no one catches him), but that's taken care of by Ureshiko's magic. Superman regularly snatches Lois Lane out of the sky. He'll sometimes justify it by thinking something to the effect of "I've got to time this right: match my velocity to hers and then gradually slow us," but that doesn't work when they were only seconds from hitting the ground. Also, he fairly often knocks or grabs people at super speed, making that hilarious effect where whatever they were holding at the time would suddenly be suspended in the air as they disappear between panels. Lampshaded in Emperor Joker, where he accidentally kills Lois this way. She gets better. Briefly. After the Joker's control over the universe (long story) is defeated, he grabs her this way again, but this time he apparently remembers not to accelerate so fast. Not surprisingly, most superheroes with Flight will do the same at one time or another. Realistically, they would have the additional concern of taking injury themselves from colliding with a falling object, which at least the invulnerable Superman has no concerns about. In Superman's case, this was one of the main justifications for the Post-Crisis "unconscious telekinesis" theory. Later made explicit in the case of Superboy, who learned to control it consciously. One Action Comics issue has a very ill Superman convey to villains they better stand down as he, Superman, no longer has the ability to -pull- his punches and their heads might just go explodey. Same goes for The Flash, who would certainly be giving high G-load injuries to the people he picks up and rushes off with at super-speed, as his acceleration is depicted as nearly instantaneous. Indeed, the Speed Force was invented largely to "explain" these kinds of mechanics. In one issue of the Justice League of America, he saves the population of an entire North Korean town from a nuclear meltdown in about 12 seconds. The speeds he would have needed to achieve this should have turned everyone he touched, carried, or simply ran past into chunky red jello. Subverted in the Marvel Comics Eternals, where their Speeder, even when trying his hardest not to kill terrorists while disarming them, and moving at half the speed of light, still breaks their arms. Ultimate Universe Quicksilver did something similar, killing a lesser speedster by grabbing hold of her and accelerating so fast that her body was completely shredded. Originally subverted with Spider-Man. He attempted to catch Gwen Stacy with his webbing after the Green Goblin tossed her off a bridge, but the sudden stop snapped her neck. Marvel Comics later tried to reverse course on this, saying that it, indeed, was the fall that killed her; that the shock caused her to have a heart attack and die. They've even gone so far as to edit the prominent "SNAP!" sound effect out of the panel where Spidey catches Gwen in reprints. After the "shock of the fall" line (originated by Stan Lee) was discredited, the current line of Word of God thinking is that since Soft Water doesn't really exist, nothing Spidey could reasonably have done at the time could have saved her. Catch her, she snaps. Don't catch her, she splats. In universe, Spidey's learned from his mistakes. In a scenario years later where Mary Jane is sent plummeting, he knows to fire his webbing at multiple points, stopping Mary-Jane from getting lethal whiplash. And in New Avengers (vol. 2) #21, he catches falling teammates in a soft net of web instead of snaring them with a single line. 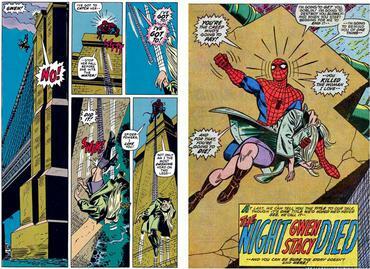 There's also a What If issue where Spidey manages to save Gwen in this manner, and in a time travel storyline in Spider-Girl, the younger webslinger tells Peter to stop, jumps past him, embraces Gwen and then uses webbing to slow both of them at the same time, more gently and protecting her neck as they go. She specifically states that Peter spent most of her childhood explaining to her what he wished he could have done differently, so she knew exactly how to save Gwen this time. Averted in Batman: Hush, where Batman, after his Grappling Hook Gun line is mysteriously broken, attempts to grab onto a ledge, and immediately breaks several bones in his arms, falls further, and breaks the rest of his bones (there was even a bone chip in his skull). Ouch. Thank goodness a friendly brain surgeon was nearby. Averted in Batgirl: Year One, when Barbara Gordon's jumpline, made of normal rope, is cut by Batman before she can hurt herself with the sudden deceleration. She is later given some of the special 'batrope' to use with the explanation that it is elastic and extends/contracts in order to prevent the shock of an instant stop. Subverted in Alan Moore's Miracleman series. In one issue, the villain hurls an innocent bystander towards a building. Miracleman catches the lad, saving the child's life but breaking a few ribs in the process. In the same scene, the acceleration when the villain threw him should have had the exact same effect—snapping most of his limbs and his neck, because the villain sure didn't bother about whiplash and such. In Runaways, Victor stops Gert from falling using a steel fire escape, and references this trope, specifically the "matching speeds" angle. In Astonishing X-Men, Hisako catches a plummeting classmate with her mutant armour up. He lives, but he's a mess. In a Captain America (comics) issue, Cap is flung off a building. He doesn't catch a flagpole, he slams shield first into the cold, hard cement. His Vibranium-steel alloy shield absorbs ninety-five percent of the impact but it's the five percent that bothers the hell out of him. The same shield Shield can disperse enough force that a punch from the Incredible Hulk (who bench-presses MOUNTAINS) stops instead of nailing you into the ground like a tent peg and is explicitly the hardest thing in the Marvel universe. There's a scene in the Elf Quest: Shards storyline (link pending) where Strongbow the archer is falling to his certain death - until the human Shuna reaches out an arm so that he can use her hand as a target for an arrow with a rope attached. The other elves then grab the rope to break his fall before his weight can rip her arm off. Now in order to pull this off both Strongbow and Shuna would need to have incredibly fast reflexes, and one suspects his momentum would drag everyone else over the edge anyway. In one issue of Doom Patrol, the writer carefully averts this trope. Elasti-Girl grows to giant size to catch a plane coming in for a crash landing, by running alongside it and taking hold of the fuselage. Robotman specifically notes that simply standing still and catching it by the wings would have ripped the plane apart. Subverted in Two Thousand AD's Chopper: A sky surfer catches a young child falling from a high-rise building, but despite the surfer's efforts to cushion the fall, the child dies from the sudden stop. Subverted in a Marshal Law comic where insane Expies of Marvel heroes are fleeing a burning asylum and falling to their deaths. The Daredevil clone tries breaking his fall by latching onto a flagpole... and promptly tears his arms off. Subverted in Nikolai Dante: When Dmitri/Arkady throws Galya out a high window, Viktor dives to save her in his eagle form. He succeeds, but the force of the impact still kills her. Supergirl saves a guy from a 29,000 feet fall here. It has a happy ending, so he should be fine. In a Cloak and Dagger story where Dagger is thrown out of a plane, Cloak saves her by enclosing her in the dark dimension of his cloak...but she still has all the momentum of the fall. So he repeatedly releases her over water for a second at a time, gradually slowing her down and leaving her extremely bruised but alive. In The Incredibles, when a man jumps from the top of a building to kill himself, Mr. Incredible, who is in the top of a much lower building, jumps across the street, grabs the man in mid-air and lands in a lower floor of the building from which the man had jumped. The man ends up with serious injuries. And ends up suing Mr. Incredible. Averted at the end, when Helen/Elastigirl is thrown into the air to catch the baby—she visibly extends her arms upwards, then contracts her body upwards towards the baby before turning into a parachute. Used in The Hunchback of Notre Dame when Quasimodo falls from a parapet of the cathedral only to be caught under the armpits by Phoebus who happened to be on a lower level. Not only does Quasi not die, not only do Phoebus's arms not get completely ripped out of their sockets, but everyone lives happily ever after. During the final battle in How to Train Your Dragon, Astrid gets thrown from her dragon and goes tumbling through the air. Hiccup and Toothless fly in and catch her right before she splats. Hiccup asks Toothless if he caught her, Toothless makes sure he did and Astrid smiles rather happily considering that that catch probably should have broken her legs or spine. And in the same battle, Hiccup and Toothless (without flight control) should be splats on the ground at the end, and the only injury ends up being a leg needing to be replaced, so that should probably be chalked up to barbarian hardiness and cartoon physics. Lampshaded in the CG film Doogle, when one of the characters remarks after falling a great distance: "I'm fine: I broke the fall with my face." The "arrested fall" version also occurs in Quantum of Solace. In the new Star Trek movie, this also happens when Chekov manages to beam Kirk and Sulu back onto the Enterprise while they were falling towards the planet's surface; he manages to catch them just before they hit the ground. This is completely in keeping with how a transporter would have to work, since by re-materializing the person the forces applied to the object/person before dematerialization no longer exist, while a new set of forces are applied (consistent with the space-ship's current movement through space-time) on rematerialization. The same problem exists when the Enterprise herself is attacked or grabbed by the explosion or monster of the week, causing it to decelerate quickly enough to overcome the artificial gravity and throw people around the room. These people look like they are reacting to a change in velocity of a few feet per second, when just unexpectedly dropping out of Warp 1 to sub-light speed involves deceleration on the order of hundreds of thousands of feet per second in a very few seconds. Even if the artificial gravity takes away 99% of the problem, you still end up with strawberry jam on the bulkheads, if the entire ship doesn't fall apart concurrently. They have inertial dampers for whenever a starship transits from warp to sub-light speeds. Otherwise the ship itself wouldn't survive. The Matrix Reloaded: Neo flies very low to the ground, at a velocity that's knocking cars aside in its wake, and catches Trinity out of the air. Between the sudden vertical stop and the sudden horizontal acceleration, Trinity should have been splattered all over his sunglasses. Earlier in the same movie, Neo rescues a couple of people from a roof of a crashed and exploding truck by flying onto the scene, grabbing them by their collars, and pulling them straight up while Out-Flying the fireball. While the world of the Matrix does have rules, one of Neo's powers is explicitly being able to bend and break them, so this is justified. While not a fall, the physics-defying properties of this trope are subverted in the Blade movies, where the titular super-human grabs a hold of the back of a speeding train and painfully dislocates his shoulder. If he hadn't already being superman, otherwise he would have simply lost his shoulder. Dracula throws a baby at him, and he catches it like it's a football or something. The baby is implied to be unharmed. Subverted in Enchanted, where Giselle, the cartoon princess now a real person in New York expects to be caught when she falls, but ends up hurting both herself, and the man trying to catch her when reality doesn't live up to cartoon physics. Jack Slater, a Refugee From TV Land, has this painfully subverted when he grabs a ledge while falling. In his home universe, he does this all the time without a problem. Handled relatively reasonably in the Iron Man film: Instead of trying to catch the pilot who's falling because his ejection seat's parachute isn't opening, Tony Stark goes for the mechanism to trigger the parachute instead. Incidentally, that helps to illuminate the fact that people can be decelerated from terminal velocity pretty dang fast and still survive, just not instantaneously; otherwise parachutes would be useless. And when he first escapes from the terrorists in his Mk.1 suit, Tony falls from several hundred feet in the air into a sand dune, and suffers nothing worse than momentary dizziness, making this an example of Sand Is Water. In the sequel, it's also averted as Tony visibly drops his speed significantly before grabbing Pepper and flying her away from the exploding Hammeroid. John McClane falls down a shaft in Die Hard and grabs the edge of an air-vent. Instead of just broken fingers, he gets an Acceptable Breaks From Reality because he's in an action movie. It turns out the air-vent grab was due to a mistake by the stuntman. Left in because it looks cool, nothing is said on whether the stunt-man got bashed up. In the 1989 Batman movie, Batman uses his grapple gun to save himself and Vicki Vale after they fall off a huge cathedral. He fires the gun and then attaches it to his belt. The grappling hook lands in the belfry, slides across the floor, and then bites into a bit of stonework, and suddenly Batman and Vicki are suspended in the air, swinging romantically back and forth while searchlights play across the cathedral for no very good reason. All this without a) breaking the stonework, b) breaking off whatever attaches the gun to the belt, c) breaking the belt, d) breaking Batman in half at the waist, or e) tearing Vicki from Batman's arms to go plummeting to her doom. In Underworld the Vampires like to make entrances by jumping off buildings without so much as bending their knees. Averted in Batman Forever, when Batman dives into the death trap to save Chase and Robin. When Batman attaches the cords to Chase and when he grabs Robin, they can be seen decelerating, rather than coming to a complete stop, implying the cords are elastic. This is more noticeable when Batman rescues Robin. Played straight in The Dark Knight Saga, where Batman uses a grapple gun to snag the plummeting Joker. By all rights, the Joker's leg should have been torn out of its socket by the force of his sudden deceleration, but instead, he simply stops and Batman hauls him back up. In the same movie - just because you've jumped out of a window and grabbed your girlfriend, doesn't mean that you both won't be severely injured when you land on a taxi's hood. And in the same movie; Harvey Dent/Two Face falls from twenty, maybe thirty feet, and, according to Word of God, this kills him. Being already severely injured by the same accident that made him Two Face, as well as the angle at which he fell, was probably what did it. Hancock shows the Flying Brick titular hero grabbing a Jerkass kid, flying him high up into the air, zooming back down, and catching him by sticking his arm out. Even leaving aside the deceleration, he hit someone who can shrug off bullets and is harder than pavement. He also tosses a whale by its tail (it rhymes!) without ripping its flukes off. In contrast to Gwen Stacy above, Spider-Man successfully catches Aunt May with his webbing in his second movie. This movies' webbing is shown to be very elastic, but that doesn't stop the Riff Trax from hanging a lampshade: "And her entire skeletal system was pulverized." If anyone was going to have a heart attack from the shock, it would be May. Painfully obvious in the original Spider-Man movie, where Mary Jane is over water and in danger of falling; she does fall, but after about 40 feet she grabs onto a metal pipe. Her arms are not ripped out of their sockets. Subverted and played straight in the same scene in the 1999 movie Wing Commander, when the hangar bay was depressurizing due to damage from an attack. Blair plays it straight, when he grabs an item on the deck to stop his being sucked out into space, without any obvious discomfort or injuries. For the subversion, Maniac's rush towards the vacuum is stopped by a cable tied around his waist and held at the other end by other pilots. The sudden stop when the cable that was tied around his midsection catches makes him visibly wince in pain, and afterwards he's shown with bandages wrapped around his waist, where the cable bit into him. In Avatar, a skilled Na'vi falling in or over a forest can shed enough velocity on vines and leaves to survive a drop from a great height. It helps a lot that Pandora has lower gravity and denser atmosphere than Earth, and correspondingly falling bodies have lower terminal velocity, and Na'vi have much harder skeletal and organ structures than humans. In the French film La Haine, there is a recurring motif of the man who falls from the top of a four storey building. As he falls, he repeats, "Jusqu'ici, tout va bien" ("So far, so good", or literally "Up to here, all goes well"). Mais ce n'est pas la chute, c'est l'atterrissage. Subverted hard in The Other Guys, where the two Decoy Protagonists fall about ten stories planning to be saved by landing in bushes. Too bad they miss. Averted in The Rock. British spy John Mason offers to shake hands with FBI Director Womack, and slides a slipknot over the latter's wrist. He immediately pulls Womack over the railing of a hotel balcony, and the man is left dangling by the cord; both the sudden stop and the effort to pull him back up dislocate his shoulder and he has to carry his arm in a sling afterwards. The Return of Hanuman has a boy surviving after crushing through walls and even a guy falling off the road while driving his truck. Seems like Maruti the reincarnation of Hanuman isn't the only one who's Nigh Invulnerable. Pirates of the Caribbean plays with this; in the second film Jack Sparrow falls off a fairly high cliff and hits the ground - and not only survives, but he's in good enough shape to run in blind terror from the group of cannibals chasing him. However, he did smash through several rope bridges on the way down as well, thus decreasing his speed a little and rendering this...slightly less implausible, Slightly. GoldenEye Zig Zagged, Alec falls from a great height and lands flat on his back on a cold concrete pool floor, but still manages to survive the fall despite seemingly great injury. Although, he is killed by the Cradle antenna about a minute later, so its hard to say if he was fatally wounded. In the 2009 B-movie Infestation, a giant wasp grabs a guy and flies away. A policeman patiently waits until the pair are above a roof before shooting the wasp. Unfortunately, the victim lands on the roof headfirst and dies anyway. Averted in The Avengers when The Hulk rescues a falling Iron Man by sliding down a building to slow his fall, then sliding several hundred yards down the street before finally coming to a stop. Played straight in Sideways Stories From Wayside School. A girl fell asleep in class, rolled out the window, and fell. The playground supervisor catches her before hitting the ground. Note that the school is a 30 floor building, with her class on the top floor. Averted in Area 7, when Scarecrow does the 'Sydney Harbour Bridge' (two Maghooks connecting in midair) with Gant, thus stopping his fall. IIRC, it's described as 'one hell of a jolt' and it hurts him a lot. This trope (and the stock phase) is the syllabus of The Five Greatest Warriors. Jack's falling into a bottomless pit, and stops his fall with a Maghook. It still hurts, but not as much as it should after falling over 1000 meters. Subverted in Specials when Tally, running away, jumps off a cliff while escaping Fausto with seemingly nothing to save her (no bungee jacket or hoverboard) says before jumping, 'Hey, Fausto, how's this for crazy? Crash bracelets', and states that since crash bracelets weren't designed for anything like a jump off a cliff, she almost passed out from simply raising her arms to shoulder height. Averted nicely in Dragonquest. F'nor and Canth are dropping from a great height at what's explicitly stated as terminal velocity. The other dragonriders don't just stop them short- they form a ramp to slow them down gradually. The Hitchhiker's Guide to the Galaxy: In the Brontital/Shoe Event Horizon arc, Arthur Dent survives a fall of 15 miles by landing on the back of an enormous bird, failing to take into account the fact that the impact with the bird would be as violent as the impact with the ground would have been. The bird and Arthur have an argument about getting safely down to the ground below, which ends when Arthur apologizes for impinging on the birds' time and resumes his fall. The bird is sufficiently guilt-tripped to dive after Arthur and rescue him by grabbing him by the shoulders, resulting in both a second example of this trope and of Variable Terminal Velocity as the bird should not have been able to catch up, and even if he could he would have torn Arthur asunder in his attempt to arrest his fall. In the same arc Marvin falls from the same altitude and has his fall arrested by only the rocky ground below. He survives, but did decelerate for a whole mile through the rock. And he wasn't very happy about it. In Terry Pratchett's The Colour of Magic, the narrative stops for a brief essay on the fact that catching someone who is falling at terminal velocity would definitely kill them, but in this case it's not a problem. Rincewind himself abides by a variation of the trope. He claims he is not afraid of heights but of grounds: rightly recognizing that the ground is the actual instrument of death in a fatal fall. Also, his own life experience (and the fact that he's a just-barely-Wizard) show him multiple times that he can survive falls...provided someone or something intervenes on his behalf. Rapunzel: The One With All The Hair Prince Benjamin falls from Rapunzel's tower and has his fall "broken" when he lands on his horse, unharmed. In Percy Jackson and The Olympians, Percy can survive a fall from any height if he lands in water. Justified in that his father is Poseidon, the god of the sea. Percy could be thrown to the deepest possible part of the ocean without being crushed, freezing to death, or drowning. In the last of the Lensman books, Kim Kinnison's daughter Constance is described as having formed a close friendship with Worsel, the flying dragon Lensman, to the point where she rides him like a horse (and has done so since she was big enough to climb on). One of her sisters describes how he "pretty nearly split her in two with an eleven-gee pull-up", for which she kicked him. Smith, who cranked so much up to eleven for so long, was known for getting little things like this right. At least some works of Robert Heinlein avert this. Star Lift centers around two pilots who have to speed nine days with the constant 3.5g acceleration/deceleration. One of them dies halfway, other is left with his body irrepairably worn-out, causing Rapid Aging. In Double Star, a pilot tells about his strong, but dumb and stubborn passenger, who managed to walk under 5g... and who never walked again afterwards. "Slow" Free Trader starships in Citizen of the Galaxy accelerate at somewhat one km/s per second. It is stated that if the artificial gravity onboard fails for a split-second, all the crew will be instantly splattered into strawberry jam by 100g acceleration. Both the Dragon Boat and Simon Heap easily survive their falls in Septimus Heap. Averted in Dragon Keeper: Garden Of The Purple Dragon. Ping jumps off a burning balcony, hits a tree on the way down, then lands in a pool. However, hitting the tree and water are both seperately described as being very painful, and Ping breaks a rib or two in the process. Averted in Heroes when Nathan saves Tracy as soon as she jumps off the bridge before she has time to build up velocity and what not. Completely and technologically averted in Crusade, when Lochley's Starfury is heading into the hangar bay at ~1/2 of the Excalibur's cruising speed. Gravity traps slow the fighter so it doesn't splat on the back of the bay. Averted in Sanctuary, where a guy with the ability to fly catches a guy jumping out of a high rise building. Having descended maybe 10 to 20 stories, coupled with the would-be rescuer hitting him sideways at what would appear to be about 5 mph, the man ends up with four cracked ribs. Such an impact probably should have caused even more damage, though. A Hercules/Xena crossover (can't remember which show) where Xena is in the clutches of a flying monster hundreds of feet in the air and decides to stab it. She plummets down to earth and Hercules catches her in his arms. She's fine, of course. In one episode of Hercules: The Legendary Journeys, a baby is flying through the air and he catches it by diving to the ground and holding his hands out, which are sitting stationary on the ground when the baby lands on them unharmed. The Doctor plays it straight in "The End of Time", where he survives a fall from a spaceship in low orbit all the way down to the bottom floor of mansion with little more than a mussed-up suit and some scratches from bursting through the glass ceiling. Notably, the original script called for the fall to be much, much shorter, the ship much closer to the ground, but it was changed to look more dramatic. The Fourth Doctor wasn't quite as lucky, or durable - he dies from a much shorter fall. Discussed Trope in The Big Bang Theory. Penny: You know, I do like the one where Lois Lane falls from the helicopter and Superman swooshes down and catches her. Which one was that? Sheldon: You do know that scene was rife with scientific inaccuracy? Sheldon: No, no, let's assume that they can! Lois Lane is falling, accelerating at an initial rate of thirty-two feet per second per second. Superman swoops down to save her by reaching out two arms of steel. Miss Lane, who is now traveling at approximately one hundred twenty miles an hour, hits them, and is immediately sliced into three equal pieces. Sheldon: In what space, sir, in what space? She's two feet above the ground. Frankly, if he really loved her, he'd let her hit the pavement. It'd be a more merciful death. Falling itself does no damage whatsoever to a character -- but the impact with the ground can be mighty painful. In Exalted, Perfect Defences allow you to take no damage from anything, falling damage included. This makes sense for the ones that turn your skin to iron or even allow you to block attacks but how in Creation do you dodge the ground? It's not by "throwing yourself at the ground and missing", because Arthur Dent already tried that. Ninjas & Superspies had two martial arts powers that allowed a character to survive extremely long falls with minimal damage. The monk class in most editions of Dungeons & Dragons can survive long falls without damage as long as they're close to a wall. Pretty much any high level character can survive. You suffer 1d6 damage per 10 feet up to 20d6 damage, or generally between 60 and 80 points. You also have to roll versus death from massive damage but pretty much anyone capable of surviving the damage will make the save. Of course, by the time you're high level, you probably have other means of surviving a fall anyway. 7th Sea, as part of its Rule of Cool swashbuckling theme, allows you to fall from any height with no damage as long as you land on something "soft", including hay bales, awnings, water and people. In cutscenes in Final Fantasy XIII, Lightning utilizes a device called a Grav-Con unit to survive incredible falls and jumps (it reverses gravity just before the character hits the ground). In the game, Odin Sphere, after a boss fight in the sky, Gwendolyn laments her impending death and converses with the spirit of her dead sister. This goes on for several minutes and another cutscene plays in the middle of it. After falling long enough for a bathroom break, her lover, Oswald, saves her by making a quick jump from somewhere below and catching her. Possibly subverted, since Gwendolyn is unconscious and Oswald is barely standing afterwards, but this may be because of their previous fights and Oswald's use of his dark power to reach Gwendolyn before she hit the ground. In Rune, the multiplayer death message may state death by deceleration trauma. Space Quest quotes the trope word for word for one of their The Many Deaths of You snarky comments. In game, you actually do slow down to a stop. During cutscenes, he skids to a halt. Make of that what you will. Also, he does fall into Bottomless Pits. Averted Trope in the Tomb Raider series: Although Lara can grab onto ledges with one arm, but if she falls too far, she automatically dies no matter what she lands on and the grab action no longer works. Riddick in The Chronicles of Riddick: Escape from Butcher Bay survives a massive fall by grabbing a guard with him and holding him in front of him, which resulted in the guard hitting the ground first and taking the impact, leaving our favourite anti-hero unscathed. Badass as this may be, it landed him in a dark, underground subterranean level of the prison filled with nasty aliens with a dwindling flashlight and not much ammo. Bonus points for actually mentioning this trope, word for word. In Prince of Persia 2: The Shadow and The Flame, attempting to grab a ledge after you've fallen beyond the ordinarily lethal limit, will leave you crushed on the floor... while your arms dangle from the ledge above. In the Sands of Time games almost any fall will kill you, even ones that would only cause discomfort. Justified in that given the environments he's in, even a broken ankle or sprain would effectively kill him. In the same game if you fall from a great height but manage the get near a ledge just before hitting the floor, the prince will grab onto the ledge - completely decelerating in a fraction of a second - before losing his grip and falling to the floor. Decelerating from terminal velocity using only his fingertips doesn't harm him, but the short drop to the floor below kills him outright. Averted in Dark Forces Saga 2: Jedi Knight, which incorporated collision damage. Any abrupt impact from any direction hurts the same way; Force Jump and you'll take damage appropriately should there be a low ceiling in your way. Force Speed and run into a wall and you'll also take damage. Averted in Crackdown: arresting a long fall by grabbing onto a ledge still hurts just as much as it would normally, but in spite of the sickening "crunch" sound implying that the agent has just broken his arms, he doesn't let go of the ledge. Using the agent's stomp ability doesn't prevent damage, but falling into water does. Subverted in EA's Skate. If your character falls above a certain height without landing on a decently sized slope, he won't land the trick. This can get rather ridiculous if he looks like he should have been able to land the jump. If this is the case, your skater will stand firm for a second, but then just slump over and rag doll. In the Halo novel First Strike, a collection of Spartans make a similar freefall from an approaching shuttle in low orbit and nearly all suffer severe injury or death. However, these Spartans are wearing "Mark V" armor(the armor MC has in Halo 1) rather than the "Mark VI" that the MC wears in Halo 2 and 3. This is all justified in The Fall of Reach where the SPARTAN-IIs were all modified to have steel coated bones, super strength, and other modifications. They also tested the armor on normal humans. The armor moved too fast for them, and liquefied what tried to move. Then they convulsed in pain and were turned to 100% liquid. Basically, Master Chief and the other SPARTANs can only use it due to extensive modification, which is amplified by the suit. In the Halo 3 beta if you turned up the movement speed as high as it could go, players could die by simply running into each other fast enough. Halo: Reach has your character thrown off a doomed Covenant Corvette, and you survive, despite the (relatively) old armor you have access to. How do they explain this? If you look closely enough at the thing on your back, you can see the words "REENTRY PACK" stamped on the side of it. It's (apparently) able to lock the Spartan's armor like what Master Chief did in Halo 2/3 and/or augment the energy shield to better withstand the re-entry. In most gameplay situations, you automatically die in midair after falling about 30 feet. Averted with the summoning stones introduced in Burning Crusade, where if someone is falling off a cliff and is summoned to the dungeon, they hit the ground with all the force they should Of course, this would require rather careful timing. When Wrath of the Lich King introduced a dungeon finder that allowed you to teleport to dungeons at will, they made the caveat that teleportation was not possible while falling. This is averted in Wallace and Gromit: Project Zoo. A fall over a certain height will injure or even kill Gromit no matter what is done. Portal lacks fall damage, but lampshades it by putting spring mechanisms on Chell's heels that absorb the force of impact. The game's own developer commentary discusses this—Chell was given leg springs because playtesters complained about her surviving "falls that would kill Gordon Freeman." Portal is notable in that its unique conservation of momentum allows terminal velocity to be reached over short distances and vertical acceleration can quickly become horizontal. Yet you always land on your feet, completely upright. And if you construct your portals a certain way (both on the floor but "aligned" improperly) and bounce between them over and over, you can quickly get turned upside-down, though Chell is always capable of righting herself. The final promo for the sequel shows that Chell now has special boots instead of just the springs. The narrator Cave Johnson claims they prevent her from landing anywhere except on her feet (there is no evidence to support this, as all of Chell's flips are of her own accord). Note that this is not mentioned in the game proper although it is commented on by GLaDOS) and early in the game, Wheatley still sounds concerned about Chell jumping into a large pit and landing on, say, her head. Half-Life itself does have falling damage, but if the player character can catch hold of a ladder (or rope, in some sequels) on the way down, all that momentum dissipates like magic. Additionally, Soft Water is in full effect, such that a few inches of water will cancel the momentum of the player character. Entirely averted in the Banjo-Kazooie series: after about two stories' worth of falling, Banjo loses control and can no longer grab anything or use any ability similar to a double jump, which he has several of. You can also perform his and Kazooie's version of the Ground Pound while falling like that, and if you're close enough to the ground when you do it, you won't take damage. Averted in Crysis. If you mod your speed mode (by altering the difficulty level text files - the hardest of which is suffixed with "_bauer", amusingly) to go far faster than normal, manage to run up to full speed and smack into a wall or other object of scenery (train car, solid gate, whatever) it is quite possible to do some serious harm to yourself, and possibly even kill yourself. In Team Fortress 2 the Scout doesn't take any fall damage from leaping off of high places if he does a double jump before hitting the ground. As other classes (or a Scout, if not double-jumping), you take falling damage if you drop more than twice your height, approximately. If your health is low, this kills you, complete with a notification on your clumsy, painful death. Inverted in Spelunker, especially NES version. Falling by knee-height in NES version kills you mid-air. Also inverted in many Action 52 platformers where the main character is killed mid-air too, if the fall lasts too long. Averted in Fallout 3. Falling from a too large height will damage you, and once you've passed the damaging height limit, you don't need to go much higher to kill yourself. There's also a cheat that increases the size of your character model... but it doesn't scale physics interactions with it. So it is entirely possible to turn yourself into a giant, only to die from a knee-height fall. In Devil May Cry 3, Lady is thrown off the side of the Temen-ni-Gru by Arkham. She falls for at least 8 seconds before Dante catches her. By her ankle. Lady takes worse later on. In Left 4 Dead players that get knocked off a ledge will go into a "perilously clinging" state where they must be rescued by another player. If no one pulls them up after a certain amount of time, they fall and the game registers them as dead. Annoyingly, there was a bug in early versions where players could get stuck in this animation and then "die" from a fall of a few feet. Naturally, falling off anything from a great height will kill survivors, but there is one minor exception. In the 2nd map of Dead Air where you activate the crane, if you look in the street below, there is a truck. If you jump off the roof and land on the truck, you'll be incapped instead of killed, but the game quickly eats away your health and kills you in just two seconds. Also, landing on a zombie's head will break your fall no matter how far you had fallen. If you do this in an area where you are not supposed to be like in the example above, you die anyway. In newer versions, Aion will actually kill you simply from falling. It takes somewhere between 5 to 10 seconds of unrestricted free-falling to instantly kill you without waiting for you to hit any surface whatsoever. Particularly noticeable if you try to free-fall from the upper abyss to the lower, and catch yourself near the end of the fall. This was probably implemented to counter the common abuse which allowed you to save quite a few seconds of flight time by doing this trick. Between Abyss levels this almost the same behaviour as before. Prototype features no fall damage whatsoever; in fact there is an attack that is based on jumping as high as possible, then dropping down like a bullet and creating a MASSIVE shockwave that can even seriously damage tanks. This is justified as the protagonist has no bones to break or organs to rupture. Early subversion in Legacy of the Wizard. If you fall from higher than the character's maximum jump height, it's gonna hurt. Not a total aversion, because the damage is the same no matter how high you fall from. In the Ghost in the Shell game, the opening cut scene has our heroine leaping out of a helicopter flying high above and landing without trouble, possibly justified by her cyborg nature. And then in the rest of the game play, you die if you fall off an eight-foot high stack of crates, possibly justified by They Just Didn't Care. Base jumping without any apparent equipment is basically the Major's calling card, and it's never shown how she lands after these jumps. Mirror's Edge basically is Le Parkour on the rooftops of a futuristic city. It completely averts this trope and you have to take a roll to dampen the impact of jumps from considerable heights. If you miss a jump between buildings, there's really not much more you can do than bracing yourself for the sickening sound of a body hitting the sidewalk. No More Heroes 2 has a completely insane example in the ending. After finishing off the final boss, Travis plummets several hundred feet to the pavement, and Sylvia catches him...out of the air with one hand, while he's literally an inch from hitting the pavement, and slings him onto the back of her motorcycle. At the aforementioned event, getting shot out of a tower, you also hit several ledges on the way down. Your bones are practically all broken, but the narrator, Theresa, also says that "Sometimes the grief is so great, even Death keeps his distance." In Jet Grind Radio sequel Jet Set Radio Future, as long as you land within the level (i.e. you don't fall from a skyscraper, which deducts a few HP and sends you back to your nearest checkpoint) even ridiculously long falls cause no damage as long as you hit a grind rail or continually strike poses on your way down. Painfully inverted in Battlefield 1942. Fall damage is calculated by judging the distance in your starting height and your end height. The damage scales horribly, and is even applied to vehicles. Walking down a hill too fast and fall 3 inches? Half your HP is gone. Drive a little too fast over a bump in the road and get the front of your tank just barely off the ground? It's probably going to explode and kill you as it "lands". This also has an interesting effect when combined with the parachute. Some attacks (grenades, tank shells, aircraft splash damage, etc) blow you up into the air if they don't kill you outright. If you hit your parachute (or land on something even slightly higher than the ground you started from) you'll live. The parachute will nullify all fall damage regardless of how long it has been deployed, with the caveat that you can only deploy it once you've already fallen further than your starting height, making it tricky to deploy in time (due to reflexes and lag) if you're being abused by shoddy map geometry. Partially averted and partially played straight in Just Cause 2. The aversion: free-falling from great heights will injure or kill Rico, whether the fall is onto land or water. There are no ledges to grab onto, either. However, Rico's wrist-mounted grappling hook is essentially this trope's purest interactive representation. Need to pull yourself 50 meters up the side of a building in 2 seconds? Done! Need to make that same trip in reverse? No problem! And the piece de resistance: fly a plane 10,000 feet in the air, jump out, wait until you're about 30 feet from the ground, then fire the hook. It will attach to the ground and reel you in for no damage. So hitting the ground at terminal velocity will kill Rico. Using the grappling hook to pull him to the ground even faster allows him to survive. Also, even if falling from terminal velocity, wait to deploy your parachute at the last possible second and see what happens. That's right! All that will happen is that Rico falls down, says something along the lines of "sheesh" or "Whoa... To close for comfort." and have absolutely no damage. Worse than all of the above examples is you can bail out of a flaming out of control jet and come out about a foot off the ground and land because you were so close to the ground that the game never has you freefalling and the speed is negated when you jump out of the jet so you're perfectly fine. Flint in Alundra 2 can survive any fall... especially in cutscenes. In Dead Rising, Frank West takes roughly normal (in video game terms) falling damage, unless he does a knee drop. That's right, landing on your feet hurts, but directing all the force into your kneecap is a perfect solution. Kratos in God of War, being a demi-god, is rather good at surviving falls, unless it's into a Bottomless Pits of some kind. One particularly noteworthy example in the second game, when he performs a Literal Cliff Hanger with his chainblades after leaping off the back of a Griffin. Another occurs in the third, when he leaps from the Labyrinth inside Mount Olympus all the way into the Underworld. The Legend of Zelda - Link would always take damage falling into Bottomless Pits or deep water, but the 3D titles also added falling damage from a sufficient enough height. In later games, if you fall too far the roll move will no longer save you from damage. Ditto the Super Mario Bros. series, though a Ground Pound will negate any falling damage if it's initiated from a low enough height. Slightly subverted with Super Mario Sunshine - falling for too long will make Mario flail around unable to do anything until his splat on the floor, but if you do a Ground Pound before that, then as long as there's ground underneath, you won't take any damage. Not even if you fall until Mario begins to light on fire from falling so far. The Lord of the Rings Online: Averted. Falling from a small height will at least get you injured and limping for a few minutes. In the Game Boy versions of Turok and Turok 2, falling for a certain amount of time causes Turok to enter a different falling animation. He dies as soon as he touches any solid ground while in this animation. In the Assassin's Creed games (including Assassin's Creed II and Assassin's Creed Brotherhood), averted with Desmond Miles due to the lack of areas high enough for a fatal fall—though this is stretched in Brotherhood due to his much greater free-running. However, he becomes "desynchronized" with his ancestors Altaïr and Ezio's memories if they "die," including fatal falls. However, so long as they manage to grab onto any ledge on the way down they suffer no fall damage. Ezio also has the ability to roll (hold forward on the left stick) to reduce the fall distance for the purposes of calculating damage, which with a low enough fall can prevent fall damage. In Brotherhood, Ezio can acquire Parachutes (after completing all four of the War Machine missions; he's granted five to start and can buy more from tailors, carrying up to fifteen at once) which can be triggered during a fall to avert fall damage. The series also features Leaps of Faith, including some ridiculously cool jumps from the tallest towers in each game. The character will survive these leaps just fine, because the landing is softened by a haystack, a pile of leaves or in the latest installment, a bush of flowers. This is the ending of Haunted Castle 3, a Castlevania fangame. It is one of the most awesome, manly and over the top uses this trope has ever seen. In the first Ratchet and Clank game Ratchet and Clank wind up falling from the platform where they fight and defeat Chairman Drek. Ratchet even looks down and you literally can't see the ground from how high up they are. And yet, Clank, changing to his Thruster Pack mode, and propelling himself against Ratchet literally seconds before hitting the ground is enough for the pair to just skid against the ground a bit. The only injury sustained by either of them is Clank's broken servos in his arm, which were from the force of holding up Ratchet's weight BEFORE they fell. In Minecraft falling into water more than two blocks deep will prevent any fall damage. The same applies when catching a ladder. This actually plats into several useful constructs most notably the Water Brake(tm). Dont want to climb all the way down your mineshaft? Just toss a water block on top of a sign, and you need not worry about long climbs ever again! In In Famous, Cole can leap off the tallest building in the game, and suffer no damage at all. Unless he falls into water. Also, anything he lands on (unless he's using the Thunder Drop) will also be perfectly fine. Turns out he uses his Kinetic Shockwave to dampen his fall (notice the dust spreading from his impact point). In the Spider-Man 2 game, it's possible to save yourself from a long fall by shooting off a web zip-line, which Spidey uses to sharply pull himself horizontally. It's quite possible to jump off the Empire State Building and then suddenly jerk to the side inches from the ground. Bug!! You only die if you fell off the terrain itself (each level is a huge floating 3D terrain). As long as Bug lands on a platform, he'll be safe. One of the patches to Unreal Tournament 2003 added falling damage when you perform a wall jump (i.e. you could no longer jump down a tower and wall-jump at the last second). As a concession, the shield gun now protects against falling damage. At the end of the manor house level in Medal of Honor: Frontline, you and Geritt escape by jumping off a several story high balcony into a hay wagon. He hits the ground and survives, but you die if you miss the wagon. In the Syphon Filter series, falling more than 10 or so feet in-game is fatal, although Logan survives falls much further than this in cutscenes, such as jumping through the glass ceiling of the Pharcom Expo Center's entry hall, off a high bridge onto a train, and down an airshaft in the Agency Biolab to grab a vent just above a giant fan. At the end of the first Golden Sun game, Sheba falls off the top of Venus Lighthouse, and Felix leaps off the tower after her, in an apparent suicide dive. It's later noted that the seas miraculously rose up to the tower as they fell, and The Stinger of that game and beginning of the next shows that they washed up on a beach later, unconscious but otherwise unharmed. Sheba is a wind adept, she manipulated the winds to slow their fall, which is what caused the water to appear to rise up. Theorized by Kraden after Sheba's wind adept status is confirmed. Played straight initially in Deus Ex Human Revolution then Hand Waved with the optional addition of an augmentation that allows Jensen to fall from any height and survive. The game always shows Jensen activating something that shoots lightning downwards that, apparently, creates a cushion for a soft landing. Interestingly, this neither consumes nor requires energy. That would be the appropriately-named Icarus Landing System. It is described with the following technobabble: "A discreet augmentation surgically implanted in the user's lower back, slightly above the coccyx at the base of the vertebral column. The device has an acceleration descent sensor built in; in free fall, the unit will automatically activate the patented High-Fall Safeguard System, an EMF decelerator generating a fixed-focus electromagnetic lensing field, projected downward along the plane of the drop. This field pushes against the Earth's magnetosphere and slows the user's descent to a manageable velocity, allowing him to fall from almost any height (within reason) to a relatively soft landing." In Shadow of the Colossus, Wander can successfully break any fall if he grabs onto something before hitting the ground. This is particularly amusing to witness during the battle with the last colossus, where Wander can plummet several stories and still emerged unharmed as long as he catches a ledge on his way down. Up to a certain height, hitting the ground will only do damage, and not an enormous amount. Once you pass that height, you die on impact, even if a slightly shorter fall would barely inconvenience Wander with a maxed life bar. Batman: Arkham Asylum attempted to justify this by means of Batman's glider cape: if he is falling towards the ground, the cape will automatically open a few feet before the ground, slowing his descent somewhat. However, it's played completely straight in the sequel, in which Batman gains a new move which allows him to dive vertically (without his cape opening) and still hit the ground unharmed. Additionally, Catwoman is able to jump huge vertical distances and not take any damage when hitting the ground (it's occasionally handwaved by having her perform a combat roll when landing). Finally, in both games it's played straight in another instance, as Batman and Catwoman are able to throw mooks off of very tall buildings, but when their bodies are scanned after the fact they are invariably described as "Unconscious", even if the falls are long enough to realistically kill even a very strong person. In World of Warcraft, fall damage is quite lethal (except for the Soft Water), but a warrior (or druid in bear form) can use their Charge ability on an enemy, which causes them to rush up to that foe. However, the scripted movement for the Charge overrides the fact that they're currently falling, so they end up on the ground having suffered no damage. Also, casting Slow Fall or Levitate will instantly reduce a falling character's speed, to no ill effect, and they will suffer no damage when they hit the ground - regardless of how far they fell prior to that point. Garry's Mod is even worse than the above Half-Life 2 in this regard - no matter how far you fall, unless you have some addon that makes falls more realistically painful, at most you will suffer ten damage (which, by the way, can be easily and immediately regained by spawning and using a pair of one of the default entities that comes with Garry's Mod). As stated, there are some addons that make this more realistic, like the "Perfected Climb SWEP". EverQuest keeps similar physics to World of Warcraft: falling any significant depth will damage or kill you, with the damage being proportionate to the fall. A fall into any body of water (no matter now long the fall or how deep the water) will result in no damage. Final Fantasy Tactics has characters take fall damage if they fall a greater distance than their jump rating (4 for most classes), at a rate of 10% of Max HP per height level. A fall of 10 or more over the character's jump rating is always fatal. Given the scale of the game, this isn't actually all that high (roughly ten yards). Anybody else remember Roy Greenhilt's monologue before hitting the ground? "(I'm) an adventurer, (I) can weasel my way out of this!" No, he can't. Done pretty reasonably in Gunnerkrigg Court. When Antimony falls off the bridge, the TicTocs grab her and slow her fall until she's at a safe height... then they drop her into the river. The Adventures of Dr. McNinja—apparently Doc can land safely from any height as long as he has the cord of his grappling hook in his hands. Even his Honda can stick a pretty deft landing. In Eight Bit Theater, Thief survives an extremely long fall via the aforementioned "double jump" method. In another strip this is averted when the main characters are falling at a fast speed from hundreds of feet in the air. Even though they are teleported to the ground, that doesn't stop the acceleration from the fall. Bloody mess. Fighter: The way I figured it, the fall doesn't kill you. The ground does. So I blocked it. Thief: You blocked the Earth. Fighter: Why not? I can block magic and fire and all kinds of stuff. Thief: I hate it when the things he says that don't make sense make sense. Parodied in this strip from Lightning Made of Owls. Zigzagged in Darths and Droids on Coruscant: They have force fields to slow you down, but there's lava on the ground. After dropping Buck Godot from a great height and allowing him some time to panic, the elusive Teleporter proceeds to gradually break his fall by repeatedly punching him in the stomach. Ouch. Bug explored this. Sort of. Simultaneously averted and somewhat played straight in Drowtales when Ariel falls from the top of one tower down to the bottom, though she does stop briefly at one point. It's hard to see, but she briefly uses air sorcery to slow her descent. That said, when she hits the ground she's in bad shape with internal bleeding (both from the fall and an earlier stab wound) and it's strongly suggested that if it wasn't for the resident Empathic Healer that she would have died. Various methods of doing this in World of Warcraft are explored in this Awkward Zombie strip. In Teen Girl Squad it's mentioned that if you fall into a bottomless pit, you die of starvation. Of course, you actually die of dehydration. Every super-strong or super-fast hero in the Global Guardians PBEM Universe falls under this trope. Momentum and kinetic energy just never seem to enter into any rescue catches or super-speed evacuations. Played for Laughs/Rule of Funny recently in Survival of the Fittest, with Richard Han's death. He falls off a mountain, and screams as he falls... only for him to enter another thread as he falls, apparently screaming the entire time and only stopping when he hits the ground and dies. It's actually pretty funny as hell. Subverted or deconstructed every time in the Whateley Universe, where the powers aren't as big and the physics seems to matter more. In "Ayla and the Birthday Brawl", Elite League are running through a holographic simulation. When the Squishy Wizard Spellbinder gets blasted into the air by a magical trap and Flying Brick Bombshell flies forward to catch her, the impact knocks Spellbinder out and injures her. This is pretty prevalent in most cartoons (a fall that was meant to kill Darkwing Duck merely hurts a lot when he lands in a garbage truck; the same fall later is nonlethal to Negaduck when he bounces off electrical wires and up, even when the garbage truck is pulled away), although there is also a common subversion when a character is trying to catch something, does so... and the falling object takes their arms with it. This gives the would-be hero enough time to stare plaintively at the camera before being dragged down. On Avatar: The Last Airbender Azula falls very far off a from a flying object and manages to land perfectly on her feet on the side of a cliff. Also justified several times with Aang, who can bend the air around him to slow himself down before landing. Parodied in an episode of Futurama: Bender is about to leap off a space train (...) and his hobo friend advises him: "We're going at nearly the speed of light, so... roll when you land." Danny Phantom in human form falls dozens of feet from the air and managed to grab onto a flagpole harmlessly. The flagpole later snaps and he falls another dozen or so, bounces off a sheet attached to a building, and into bags of garbage without taking any injury, but hey. Incidentally, Skulk Tech (long story) tries to do the same thing. It doesn't work. Technus: Wow! The flagpole held? I thought for sure it would *snap* BREAAAAAAAK! Sam and Tucker are dropped from the top of a building into a dumpster. They just get grossed out. Subverted in an episode of Aeon Flux where a falling Aeon shoots a grappling hook at a bridge, before getting entangled in the rope and dying instantly when the rope finally tightens. Happened in the Tale Spin pilot: near the end, Kit is thrown off the Iron Vulture high above Cape Suzette. He is saved by Baloo, who raced to the scene all the way from Louie's with the Sea Duck in constant overdrive, and caught him inches above sea level. Happened in the Batman/Superman movie "World's Finest." Similar to what happened in Hush, Bruce Wayne tries to catch himself with his arms while falling off a building. He visibly falls at least 10 stories if not more, and is able to catch himself without ripping his arms off or breaking any bones. Done in Once Upon a Forest when Abigail falls off the flapper-wingamathing while trying to retrieve lungwort from the side of a very tall cliff, but is saved by grabbing onto the wing after Russel swoops the flying machine down to catch her. The Super Mario World cartoon, in the Mama Luigi episode. "I fell for hours! ... Well, it seemed like hours. Anyway, I was falling, nothing below me but boiling lava! Good thing I found the magic balloon!" Averted quite brutally in the Happy Tree Friends episode "Better Off Bread", in which Giggles falls off a cliff and is rescued in mid-air by Splendid the flying squirrel....and the impact snaps her spine! It gets worse. Splendid's constant acceleration and deceleration repeatedly breaks her spine, each time with a sickly "Crush" sound. The Tick (animation): "Aha! I'll bounce off that flagpole and flip to safety!" *snap* "Uh-heh! I'll bounce off that... broad, flat surface and be in a lot of pain!"]] CRASH!!! "AAAAAAGGGGGHHHH!!!" "Gravity Is a Harsh Mistress..."
In case you were wondering, The Tick (animation) averts this trope. The main character is Nigh Invulnerable, however, and escapes unharmed. The pavement got a small dent in it, though. Happens in the Bamse TV series, in the episode with the volcano. Bamse falls off the volcano, but Skalman manages to grab hold of his belt from the helicopter moments before Bamse would have hit the ground. Instead of going from terminal velocity to zero, he's going from terminal velocity downwards to a not insignificant speed upwards. Yeah. Parodied in an episode of The Simpsons, where Bart is thrown off a dam and saved by a Heel Face Turn'd Sideshow Bob swinging by on a rope. When the rope is cut, they fall for several seconds (long enough that they have to take a breath between screams)...and then Bob lands groin-first on a pipe that's sticking out. As he sits frozen in pain, Bart climbs onto a nearby ledge, then pulls Bob up too. In an episode of My Little Pony Friendship Is Magic, Rarity falls for 50 seconds, which in Earth's gravity and air resistance would be at least a mile. Rainbow Dash accelerates to Mach 1, straight down, before catching her and making an instant 90-degree turn. This is approximately 1670 G's of force. This happens again in Secret of My Excess; Spike and Rarity fall for around 30 seconds before Rainbow Dash and Fluttershy save them using only a piece of cloth. In The Cutie Mark Chronicles, Filly Fluttershy is knocked off a cloud and falls thousands of feet to earth, screaming all the way. Just when you're expecting a fall to the death, she lands in some butterflies and is perfectly fine. In a 2-part King of the Hill episode, Hank and Peggy go skydiving, but Peggy's parachute (and emergency chute) fail to deploy. Everyone fears her dead, and it's Lampshaded just how miraculous a survival from that height is. She ends up in a full body cast, goes through a psychological roller coaster, and for a few episodes is still going through physical therapy just to walk again. In the Five Episode Pilot of Gargoyles, Goliath falls off a skyscraper and tries to grab a flagpole. It snaps immediately, in what the creators have referred to as a "This-ain't-Batman" moment. Speaking of which, this was lampshaded in an episode of Batman Beyond when Terry was forced to use Bruce's old-school gear. He comments that the Grappling Hook Pistol isn't so bad - right before he wrenches his shoulder using it. Remember, its not the fall, its the sudden stop!. Happens quite sometime in Star Wars: The Clone Wars, most egregiously in the Season2 episode Landing at Point Rain. After Anakin and Ahsoka jumped down from the top of a ten-stories high droid fortress, they used the Force to slow themselves down about a meter from the groud, then they catch Rex -whom Anakin threw several meters high into the air before he himself jumped- about fives inches above ground. The examples are the surprising Subversions of this trope; where extraordinarily lucky circumstances allowed something (or several somethings) to break the fall. The list of people who play it straight, so to speak, is much, much longer. Vesna Vulovic survived a fall of 10,000 meters in 1972. Nick Alkemade survived a 5.5 kilometer fall in World War II. Alan Magee survived 6.7 kilometer fall in World War II. Ivan Chisov survived a 6.7 kilometer fall in World War II. More recently, skydiver Michael Holmes survived a 12,000 foot (3657 meter) fall when his parachute failed. Inverted with black holes, in that you actually die from spaghettification before hitting the singularity at the center. The Peregrine Falcon doesn't hit the ground, but can turn out of a stoop at such speed that it pulls Gs that would easily kill a human. Aversion in some instances as well; the shock and fear of falling can be enough to send someone into cardiac arrest, killing them or at least making them pass out before they hit ground. Modern parachutes are designed so as to open slowly, ensuring integrity of both operator and parachute. A pair of skydivers from the US Army Golden Knights collided in mid air while performing a "diamond track". One had his legs sliced off by the other's arm but survived, while the other was dead on arrival. ↑ Trevor defeats Dracula, saves his bride, jumps out of the castle and falls for about 40 seconds while killing harpies. Then he crashes into the floor, apparently dead. ...Except he's a Belmont, you know, so he just stands up and goes back home.